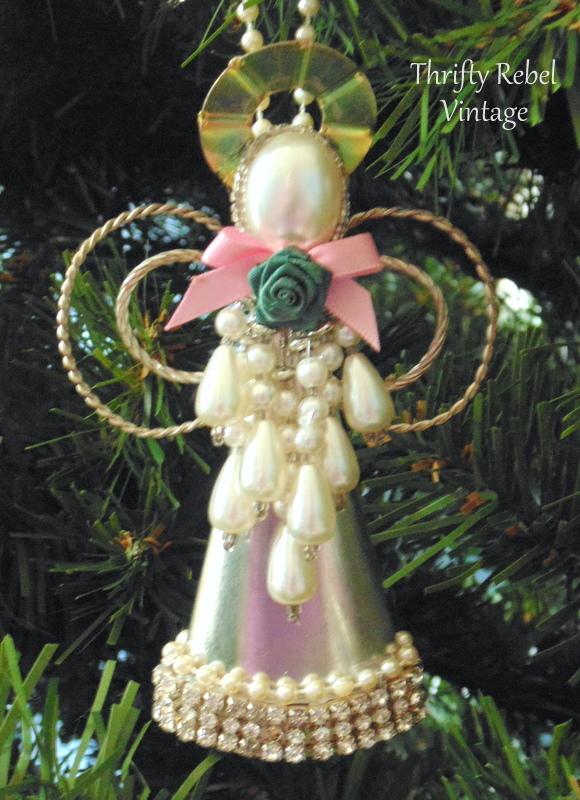 Don’t you just love to have a pretty Christmas angel ornament on the tree? 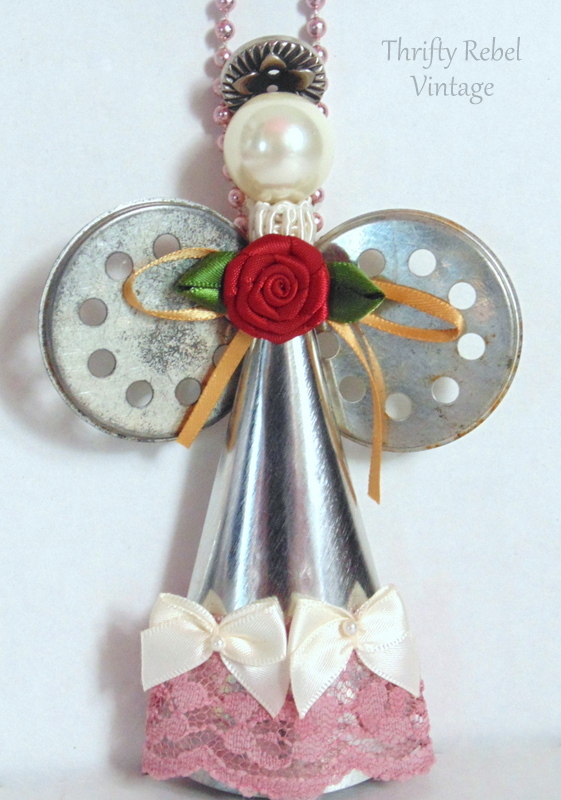 I certainly do, and today I’m sharing a repurposed angel project created purely from my stashes. When I found these cool 4″ cone thingies quite a while back I wasn’t sure what they were, but I knew they’d be great for something some day. Don’t I always think that when I find things? lol. After doing some quick research I discovered that they were cream horn molds. Cool, I thought… and I put them away in my baking stuff to-be-repurposed-someday stash. 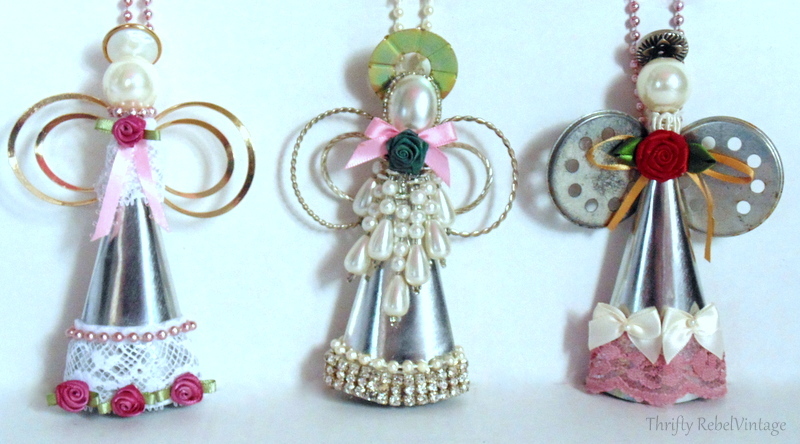 When I was looking through my craft desk drawers the other day I found them and I immediately decided I had to make an angel ornament… or three. I’ve included affiliate links in this post. If you purchase products by clicking on one of the links I’ll receive a small commission of any sales, but it doesn’t cost you a penny more. This affiliate income helps to keep TRV going, and I thank you so much for your support. Read my full disclosure. 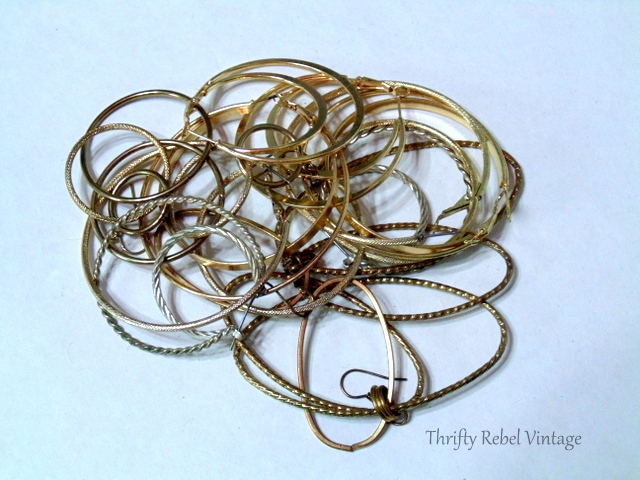 The first thing I did was flatten them just a bit, and then I went into my jewelry stash of bits and bobs. 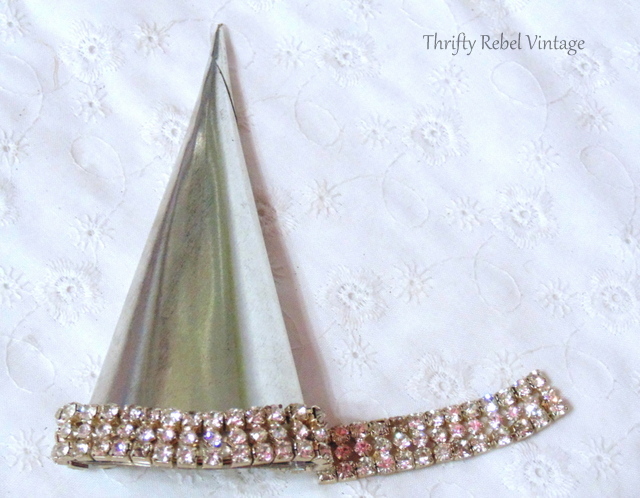 Using my glue gun I started to dress the angel up… starting with this piece of a rhinestone bracelet. Then I went into my hoop earrings stash looking for wings. 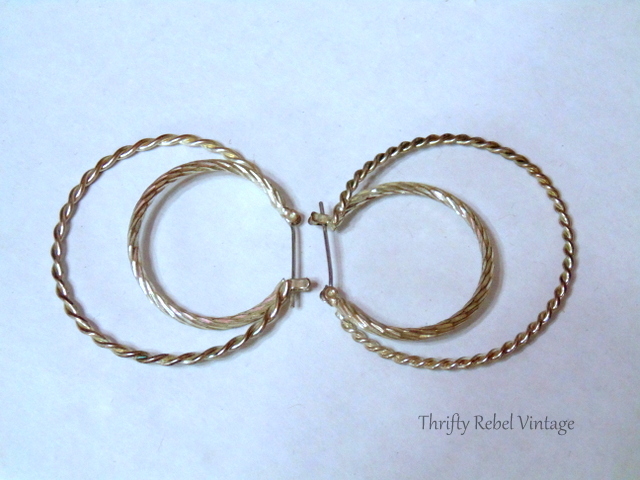 …and bent the earrings together. This gave me more of the earrings to glue. Don’t they look just like wings? 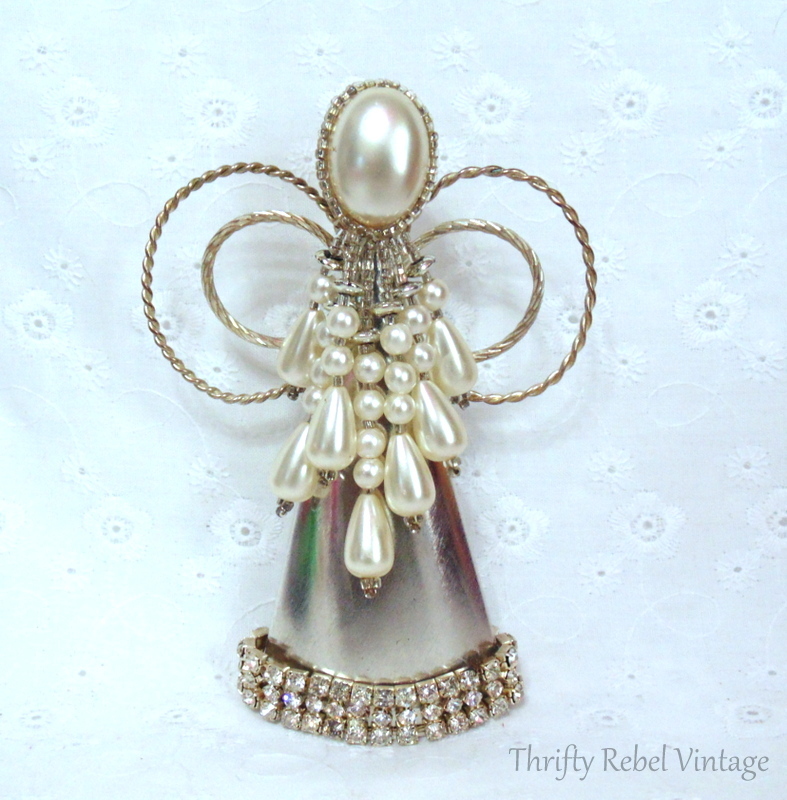 When I found the vintage faux-pearl beaded earring I knew it was perfect for the angel face. I just love how the pearls cascade down the front. 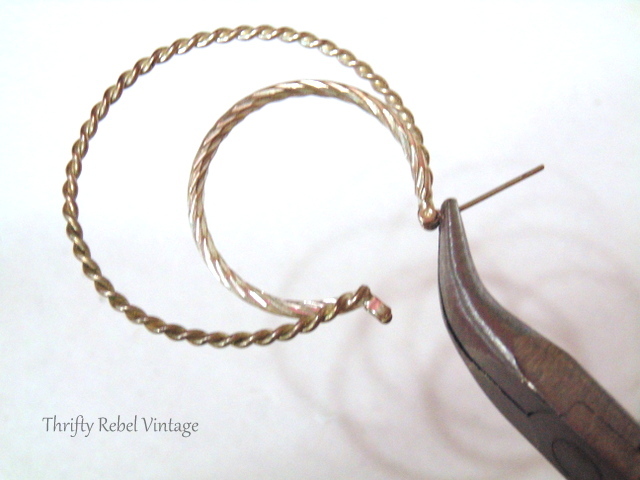 This earring’s partner was used last year to make an easy spoon pendant. I glued the wings to the back of the mold, and went looking in my hardware junk stash for a halo. I found a washer thingie and glued it on. Then I added the millinery flower and some pearl beading around the bottom. I also glued on some pearl beading for hanging. 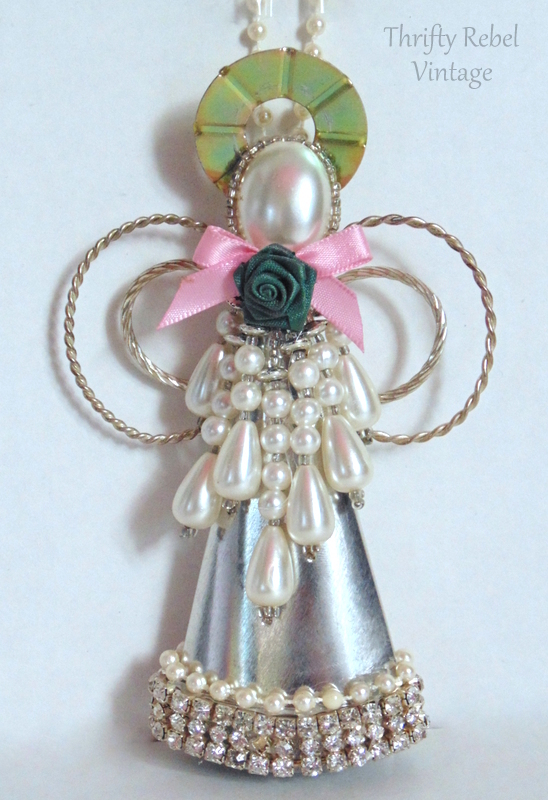 For this one I used a faux pearl from a necklace for her head and gold hoop earrings for her wings. Her halo is a pearlescent button. I decorated her with some lace, millinery flowers, and pink beading. 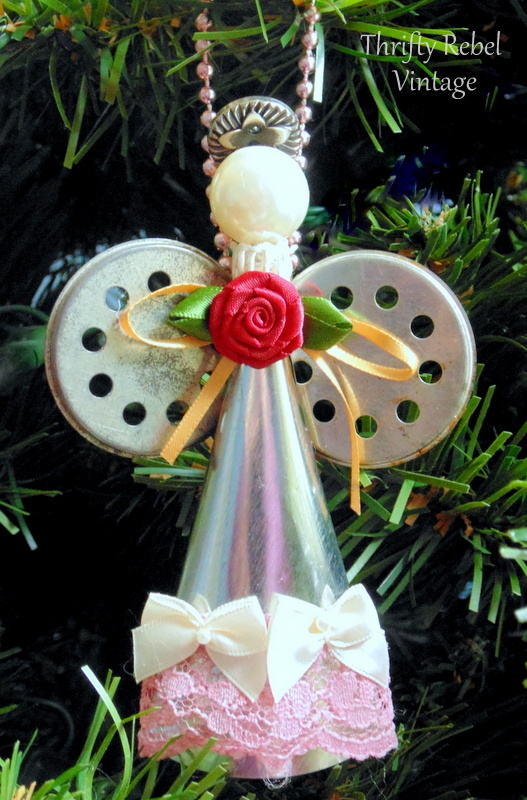 For this one I used two vintage cookie press disks for the wings, and her halo is a silver button. I added some trim around her neckline, a lone millinery flower, pink lace and 2 small sweet bows. Stash projects like this are so much fun because I never know what the end result will be until I’m done. I just kinda wing it as I go, and there’s so much freedom in that kind of creating. Save this project for later by pinning to your favourite board. 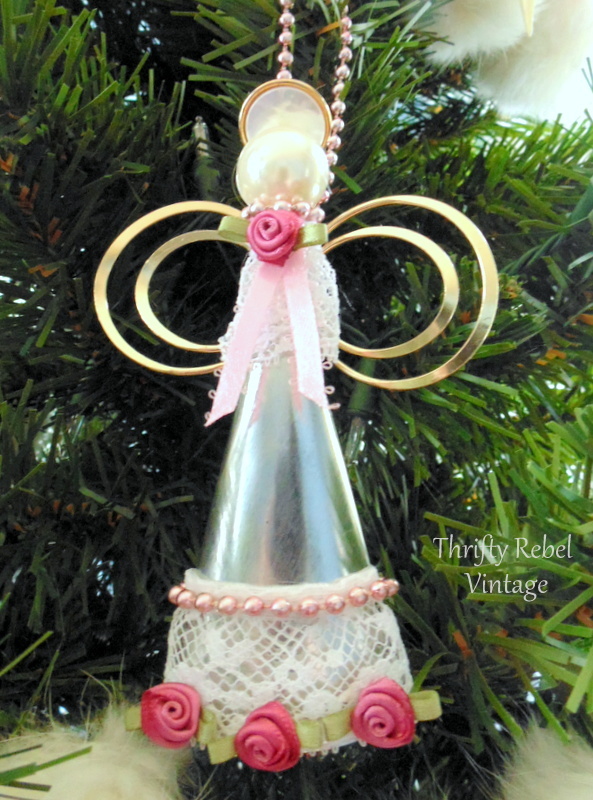 These angel ornaments are pretty easy to make with just a glue gun and whatever you have on hand to pretty them up, and the possibilities are really endless. 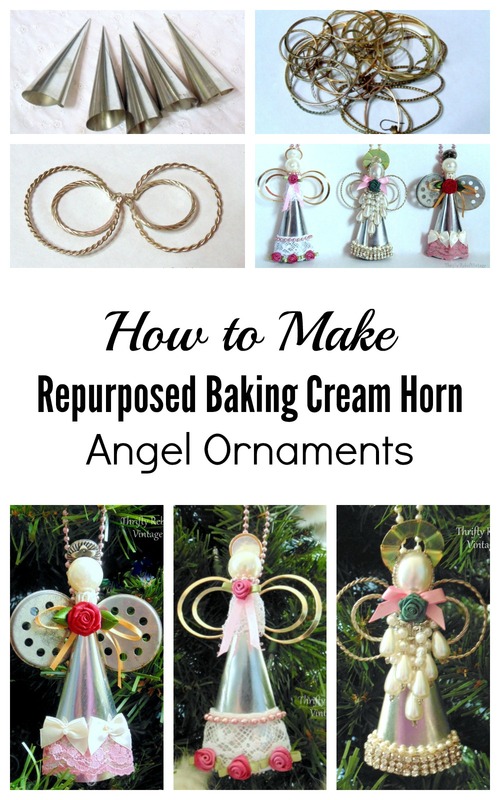 If you enjoyed this project you might also enjoy my Chandelier Crystal Angel Ornaments, my Book Angel, and my Repurposed Salt & Pepper Angels. You are SO DARN CREATIVE! I always look forward to your posts! Oooh! these are adorable and elegant, Tuula! Using the hoop earrings as wings is a stroke of pure genius. Love them all! Those are beautiful tuula! I love how they are a touch industrial yet so very feminine at the same time! Thanks Tania! I’ve always loved the combo of metal with lace and flowers. How creative, Tuula! Your angels are so unique and absolutely gorgeous ! I bet they hold a special place for you in the amazement category. I know I’ll make something and say to myself, “I can’t believe I made that!” These are truly precious! Thanks very much Gail! It’s always fun to do a stash project, and use up some bits and pieces. These kinds of projects are the most fun for me. Absolutely beautiful and so very, very, very creative. I could have looked at them for years and never thought of doing that. Thank you so much Patty! I do love using all the little treasures in my stashes. Those are adorable Tuula! You should sell them in your Etsy shop! Adorable. That is such a great use of your items. Thanks for sharing. Thanks Pam! It is fun to use up some of my stashes. Sitting around the craft table with you and your stash woul be such a good time! Very sweet! What a fun craft to do when you have all the bits and bobs you do. I love every one of them! Thanks AnnMarie! Stash projects are a favourite of mine. It’s nice to use up some bits and pieces. Thanks so much Cecilia! It’s always fun to find something cool to repurpose in a new way. Tuula, your angels are beautiful. I love all of them. 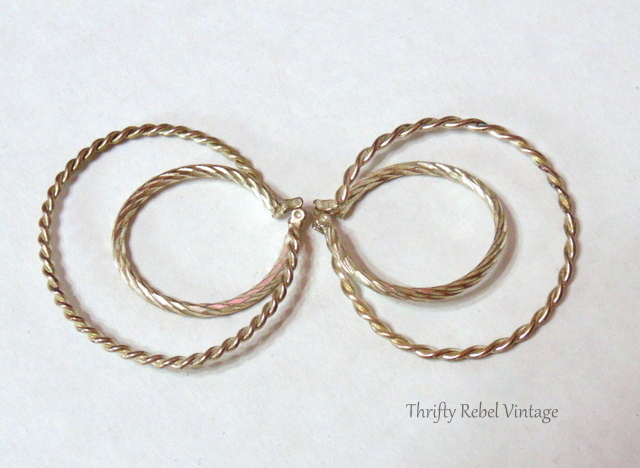 Thank you for sharing them with us at Vintage Charm. I will be featuring them this week. Thanks very much Mary! They were a lot of fun to make and will be on my pink themed tree every year. Oh my goodness! Just as cute as can be! Love your creative ideas. Tuula, these cream horns are the same things I used for my Christmas trees! I didn’t know they were cream horns! Or I guess I forgot b/c I see I made an earlier comment about this. 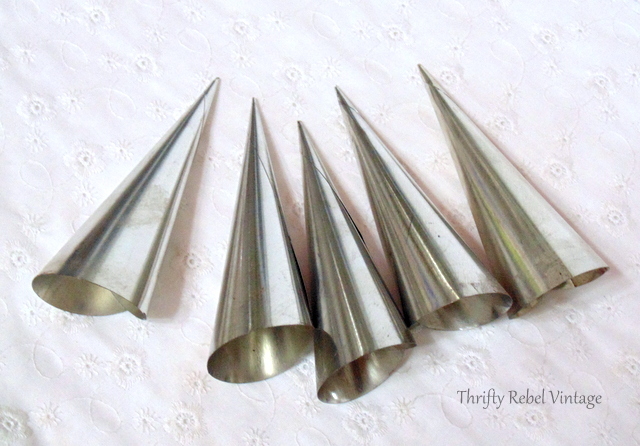 I called them “icing cones” b/c they reminded me of those things you push icing through. Whatever they are, I love your angels, and all the unique materials you used to put them together. So clever! Thanks so much Florence! I didn’t know what they were until I looked them up. I had never seen them before, but I just thought they were pretty cool. They are really cute. Visiting from Blogging Fifty. Thanks very much Randi! 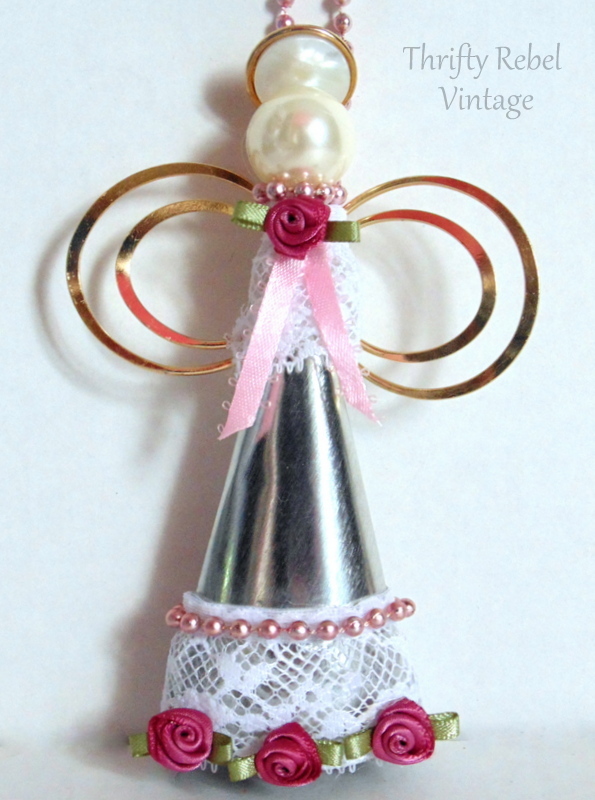 These angels are a great way to use up bits and pieces left over from other projects. Thanks so much Marie! I had a lot of fun making these. They’re a great way to use up bits and piece.